Everything is inlaid so it's all nice and flat. I used some Peacock Feathers distress ink on the background. I cut the snow globe out of that and then again out of the white. I inlaid the white back into the distressed piece that I had cut the first one out of. I then added the background from the distress inked piece back into it and cut out the holly and berries out of green and red and added them into the design too. This is a tedious process, but this card really didn't take me long at all. I was surprised how quickly it all came together. 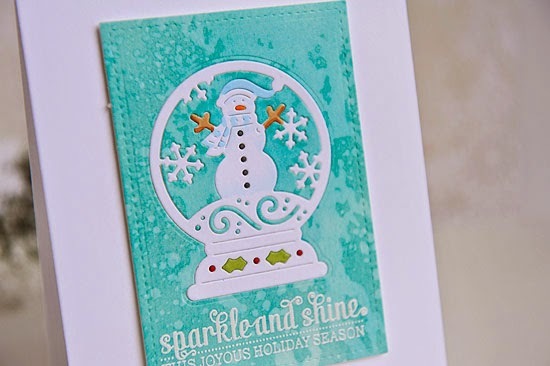 I stamped and embossed the greeting with white embossing powder. I also added a little bit of color to my snowman with Copic markers. Wow!! Just gorgeous! Heading over the Cottage Cutz to check out that die!! I know what you mean, I feel like I'm just getting started with Christmas cards!! Your card is absolutely gorgeous! Hope the kids feel better soon and happy New Year's! Oh, how beautiful, Kay! I love how you created your background...it's perfect with your snow globe and sentiment, and your details are just perfect! How fun that you received so many new crafty goodies from Santa...I can't wait to see more! And, what better way to get a head start on next years' cards! Sending you my best wishes for a very Happy New Year ~ hugs to you! Super Cute Kay - Gorgeous Colors :) Happy New Year!!! What a fantastic card Kay. I love that die and of course you've showcased it just beautifully. I hope you don't get sick. How cool! I love the peacock feathers background and how everything is inlaid. So much fun detail! I hope the kids feel better by now!! I got something on Christmas Eve and almost didn't go to Santa Cruz with my dd and gd but I did and it was fun!! Beautiful card as always!! So sad the kids got sick . One or two were sick here too ,guess that's how I got it. Love this gorgeous snowglobe and your beautiful background! Hope you have a wonderful 2015! Just gorgeous - love that die! Happy 2015! Fabulous card, Kay! The snow globe is neat and I like how you inlaid everything. That background looks fantastic. I really need to play with my distress inks! So happy for you to have gotten lots of new toys!! That means more eye candy for us. Who wouldn't love that? I am sorry to hear the kids got sick. Just not fun that it happened on the jolliest day of the year. Hope they have fully recovered by now. Happy New Year to you and your lovely family. Hugs! Ah! so pretty :) love the inlaid look ! Aiming to catch up on your gorgeous creations, Kay - and what a fabulously wonderful starting point this one is! Absolutely exquisite! Neither Cottage Cutz or ME are in my collection, but I'll be scoping out some 'prospects' soon, after seeing your dazzling inspiration. LOVE this! Thank you immensely for your warm, compassionate, supportive comments of late; they mean the WORLD to me! And the hugs: hanging on incredibly tightly! You are such a gem!